This beautiful new edition, re-designed for Pooh's 90th anniversary, brings together four volumes in one stunning slipcased gift book: Winnie-the-Pooh, The House at Pooh Corner, When We Were Very Young and Now We Are Six. A. A. Milne's Winnie-the-Pooh is nothing less than a true children's classic. Winnie-the-Pooh may be a bear of very little brain, but thanks to his friends Piglet, Eeyore and, of course, Christopher Robin, he's never far from an adventure. 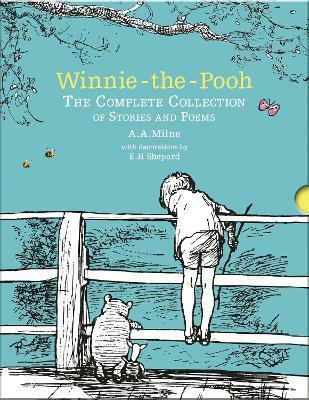 This very special collection will delight fans of Winnie-the-Pooh young and old. Relive all your favourite episodes from the Hundred Acre Wood, brought stunningly to life with the iconic illustrations from E.H. Shepard.